1. Wind seizing strand around rope at least sevent times, keeping wraps close together and in tension. Twist ends of strand together by hand. 2. Continue twisting with with nippers to take up slack "A". 3. 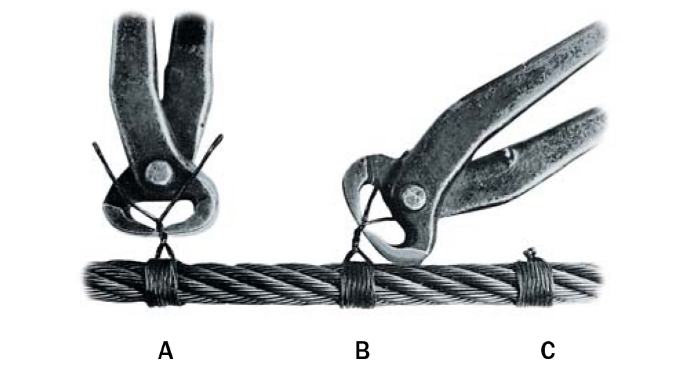 Tighten serving by using nippers as lever against rope "B". 4. Twist strand tightly against serving, winding twisted strand into knot before cutting off ends of strand. Pound knot snugly against rope "C". 1. 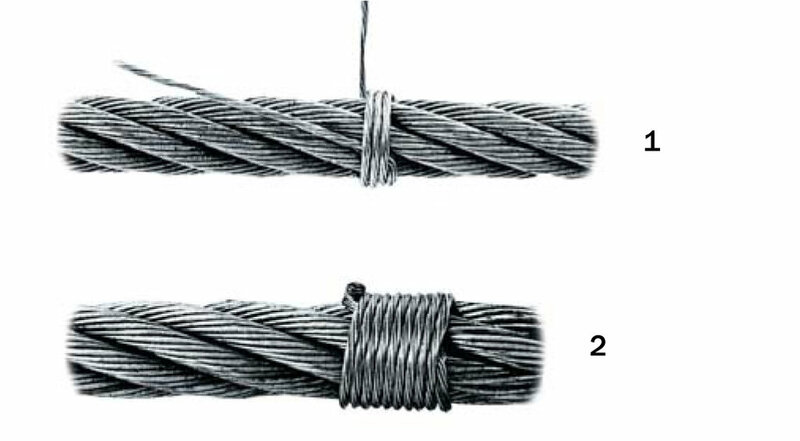 Lay one end of the seizing strand or wire in the groove between two strands of the wire rope and wrap the other end tightly over the portion of the groove. Only Rotation Resistant wire rope can be welded. Although it seems like a good and clean method, it restricts the individual strands from movement when the rope is bent around the wedge of a wedge socket. This causes "High Strand" from the inner wires that wanted to extend beyond the cute end when wrapped around the wedge. These high strands milk up the hoist rope and tend to settle on the spool in the unused portion. They will become deformed after time from the used portion spooling over them time after time. Welding is not desirable. Wedge sockets are one of the most popular methods of end attachment. For field and or job attachment, it is easily installed and quickly dismantled. There are two types of wedge sockets, the standard type and a special type with a wedge design that protrudes from the nose of the socket. 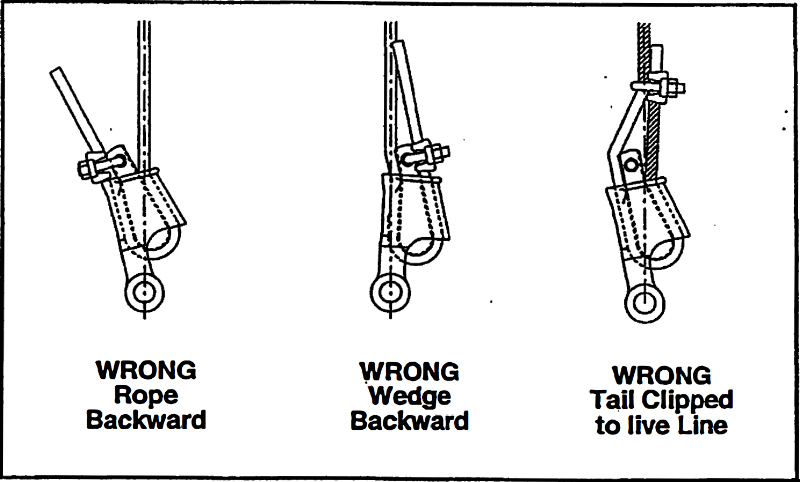 This allows a wire rope clip to be attached through the wedge to the dead end of the wire rope. 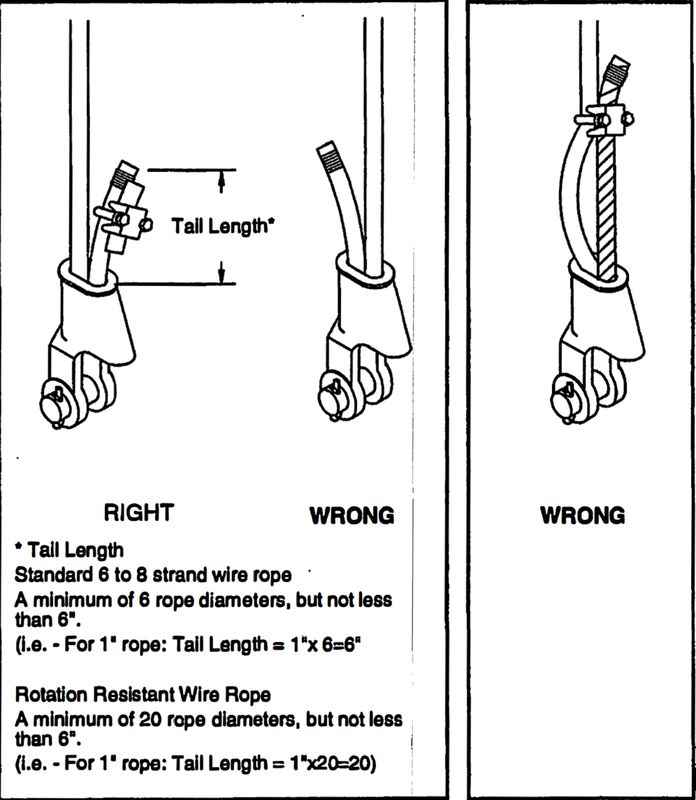 Tail length for 6 to 8 strand wire rope is a minimum of 6 rope diameters, but not less than 6". For Rotation Resistant wire rope, a minimum of 20 rope diameters, but not less than 6". Tail Length for Standard 6 to 8 Strand Wire Rope: Tail length should be a minimum of 6 rope diameters, but not less than 6 inches. Rotation Resistant Wire Rope: Tail length should be a minimum of 20 rope diameters, but not less than 6 inches.